Space 4 Art’s Permanent Home on Market Street is envisioned as a cutting-edge, multidisciplinary arts center where artists live, work, share their work, and provide project-based STEAM (Science, Technology, Engineering, Arts, and Math) education for local schoolchildren in an innovative environment. When artists live and work together, they discover new ways of thinking, working, teaching students, and connecting with their communities. This grows the local arts community, expands San Diego’s burgeoning creative economy, serves as a catalyst for economic development in a historically disadvantaged neighborhood, and improves student outcomes across the board, and especially for underserved youth. The arts center will serve as an unparalleled resource for local and visiting artists; a vibrant, crucial nexus for arts and culture in San Diego; and an arts enrichment center for students of all ages and stages of development, with a special focus on historically under-represented individuals and communities. This 1,400 square-foot, commission-free gallery will serve as an opportunity for local artists, including student, artists, to exhibit their work. This space also serves as a beautiful, one-of-a-kind venue for a wide range of community events. In keeping with our mission, Space 4 Art will not charge artists to exhibit their work, nor take any commission when exhibited art is sold. Rental fees will be on a sliding scale for maximum community benefit. The amphitheater is an open-air, partially covered space seating 200 people, with overflow for up to 300. This fully equipped, state-of-the-art amphitheater will have lighting and sound systems, as well as a green room, kitchen, and bathrooms. When completed, Space 4 Art’s premiere theatre will be available year-round on a sliding scale for events and programs to benefit the entire San Diego community. Accessible to Market Street by footbridge, the amphitheater will also serve as a much-needed community hub in a neighborhood that has few public gathering spaces. With million-dollar views of downtown San Diego and the Coronado Bridge, the indoor/outdoor event space is suitable for gatherings of up to 800 people when used in conjunction with the amphitheater. Equipped with a kitchen, snack bar, and bathrooms, and boasting great views, this is a flexible community space suitable for such diverse events as weddings, school programs, and sunset cocktail parties. Not only will the community enjoy the use of this space, but Space 4 Art will benefit from hosting a wide range of activities and introducing nontraditional audiences to Space 4 Art’s mission and cutting-edge art. This state-of-the-art wood and metal shop is designed for flexibility and optimal use. With both indoor and outdoor spaces, artists can develop their skills and learn from teachers and mentors at Space 4 Art. The shop will include an instructional area for students, interns, and workers from all over San Diego. In addition to supporting Space 4 Art, the shop’s naming rights will benefit students in our innovative, STEAM-based educational outreach programs and the community at large by providing a training center for specialized trade skills. Space 4 Art ’s flexible, state-of-the-art classroom will serve as an important nexus for our innovative educational outreach program. Focusing on short- and long-term internships that combine project based learning and S.T.E .A.M. (Science, Technology, Engineering, Arts, and Math) education, Space 4 Art artist-educators will work with historically disadvantaged youth from the greater Logan Heights area and disadvantaged communities as far away as Chula Vista. 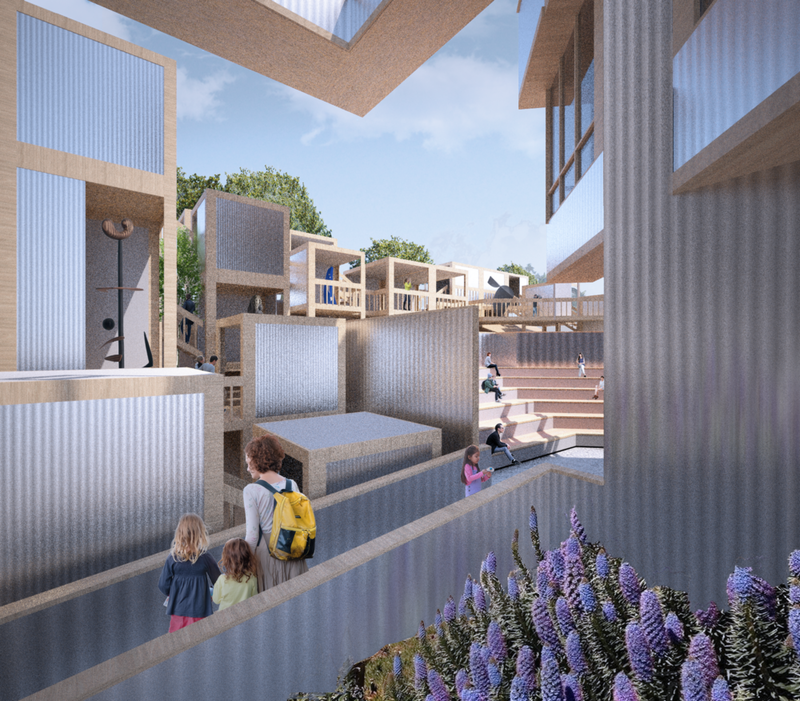 This indoor-outdoor classroom space will also be used for adult education, with Space 4 Art artist-educators teaching trade skills to community members seeking to upgrade their earning potential and quality of life. The pop-up gallery spaces will be small, flexible, covered, outdoor components with moving walls and protected areas custom-designed for the art on display. Each module can be sized up to 8x8 cubic feet. The pop-up galleries offer artists opportunities to explore new modes of creating art. They also provide viewers with innovative art experiences.